We often get asked about Napa Valley – where to stay, where to eat, where to go wine-tasting and fun things to do. Over the years, we’ve enjoyed exploring the quaint little towns of Yountville, St. Helena and Calistoga. 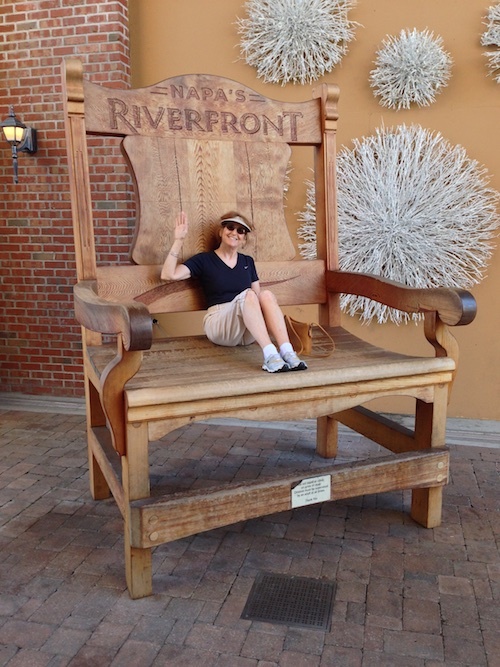 Recently we ventured into Downtown Napa for a long weekend getaway and what a delight! We parked our car and didn’t have to drive anywhere for the whole weekend. Everything we wanted to do and see was right there, all within easy walking distance to our hotel – outdoor cafes, shops, restaurants, spas, live entertainment, wine bars and over 20 tasting rooms. This entry was posted in Food / Restaurants, Fun Things to Do, San Francisco Bay Area, Travel and tagged downtown napa, gotts napa, historic napa, la toque, Napa, napa general store, napa giant chair, napa river inn, napa riverfront, napa riverwalk, napa valley wine train, napa winetasting, oxbow public market, westin verasa napa on March 25, 2015 by Alana.